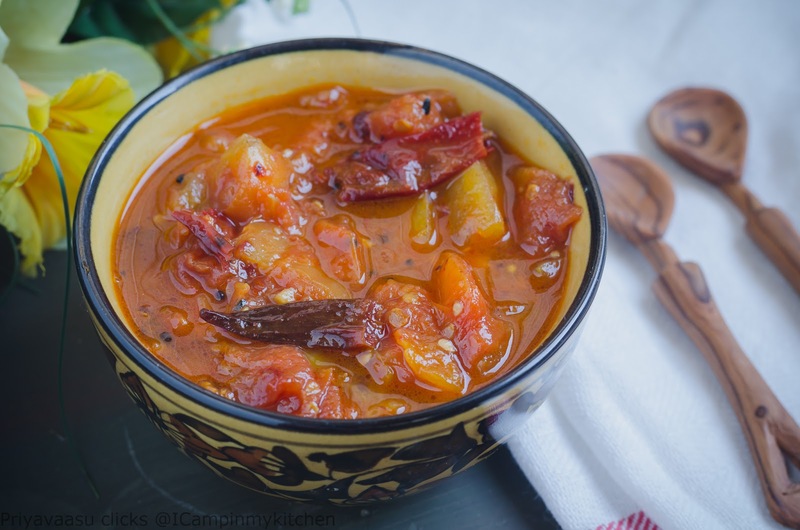 The last one for this week is this delicious Morekuzhambu with sundaikaai. 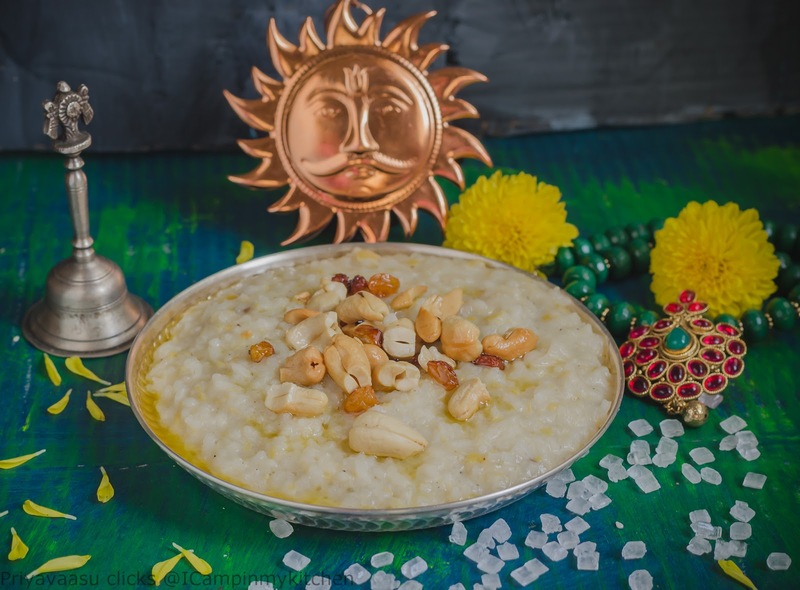 This uses the neer sundaikaai, which i posted yesterday. 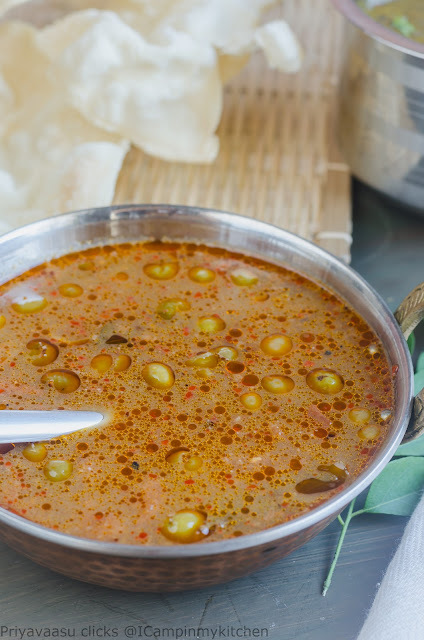 It takes flat 10 minutes to make this recipe, if u have the Neer Sundaikaai ready. 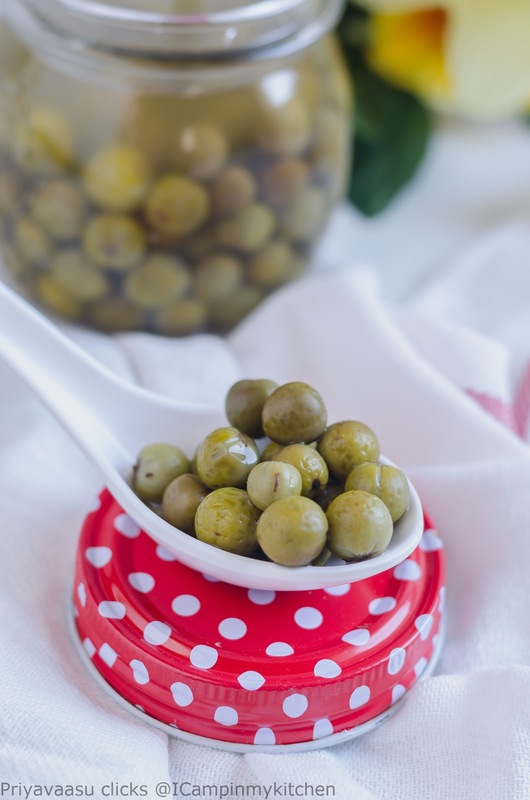 The berries doesn't have that bitter taste, maybe due the brine, when sauteed in hot oil along with basic spices,they give beautiful aroma and taste to the final recipe. Try it and let me know how you liked it. Zake the ingredients given under 'To grind' in a small mixer and add 1/4 cup of water to it and grind to a fine paste. Mix this ground masala with curd. Add 1/4 of water to the mixer, wash it well and add it to the curd mix. Heat a pan with oil, when it is hot, splutter mustard seeds, crackle cumin, add broken red chilies and curry leaves. Sauté this for 30 seconds. To this tempering, add the sundaikaai/turkey berry. Sauté this in a medium flame until golden brown, take care, not to burn the berries. Keep the flame simmer and sauté it, when it turns golden brown, add the coconut masala mixed curd to this sizzling berries, add salt mix well and switch off the stove. Let it sit for 10-15 minutes for the flavors to mingle. Serve it warm along with rice. The final week of January BM, for which i was prepared a fortnight earlier. Turkey berries, how many of you like to cook with them. I love making puli kuzhambu/kaara Kuzhambu. Recently i tried making more kuzhambu with them, which tasted out of the world. I wil be posting recipes of sundaikaai/turkey berries, for 3 days now. The first in line is the finger-licking kuzhambu. 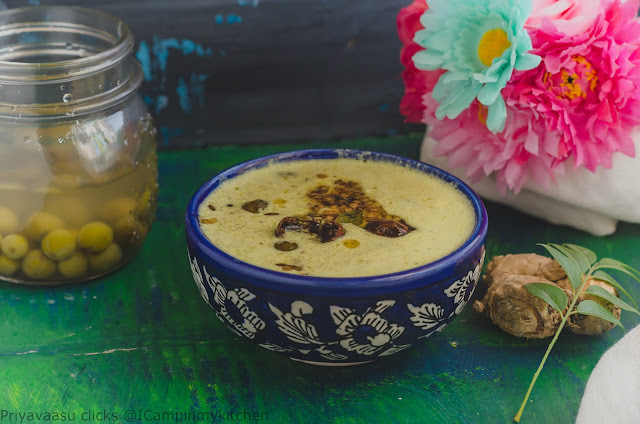 It is super hit recipe at home and my elder one totally falls for this. This kuzhambu and some potato curry, he is settled. 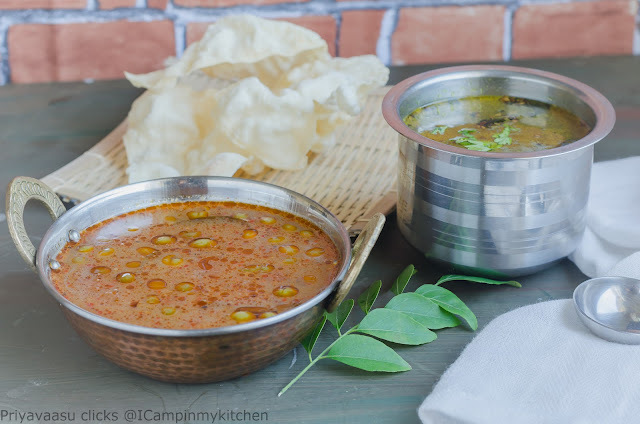 If you love a tangy gravy, then you will definitely like this kuzhambu. Some might feel, this gravy might be bitter, but definitely not. The berries are crushed to remove the seeds inside them, which make them bitter, so you can very well go ahead and try it, you will definitely like it. Soak Tamarind in warm water for 15 minutes. Extract around 3-4 cups of tamarind extract and set aside. Wash the turkey berries and take them in a zip loc cover. 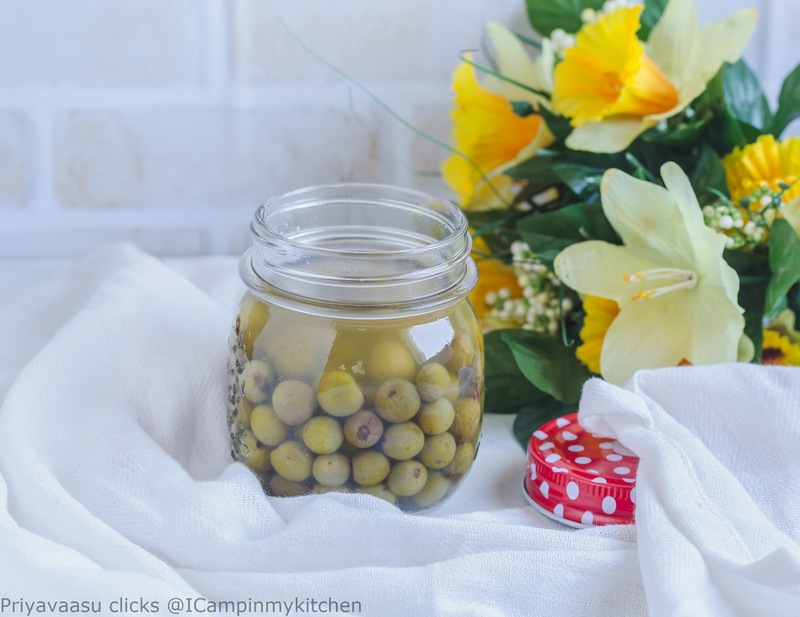 Now place the cover on the kitchen counter and using a pestle or a roller crush the berries. This is done to crack the berries and remove the seeds inside, which make the berries very bitter. Taking the berries in the cover, helps to contain the mess inside the cover itself. This can be done straight on the kitchen counter also, but there will be little mess on the counter, which need to be attended immediately. Take the crushed berries in another bowl, add water and wash the seeds and drain the berries skin alone. Discard the water with the seeds. Heat a kadai/Deep pan, add gingely oil, when it is hot enough, splutter mustard seeds, add methi, hing, turmeric powder and curry leaves. Saute for 30 seconds. Now add the turkey berries, and saute for a minute. Add chopped tomatoes and let it sweat for a minute. To this add sambar powder and mix well. Adding sambar powder while sauteing veggies gives a deep and rich color, the trademark of kaarakuzhambu/puli kuzhambu. Once mixed, add the tamarind water and mix well. Add salt to this and let this cook in a medium flame, until the gravy thickens well. Some prefer to add diluted rice powder to the puli kuzhambu, but i prefer mine, thickened on its own. Once the gravy thickens, the oil separates and floats on top. 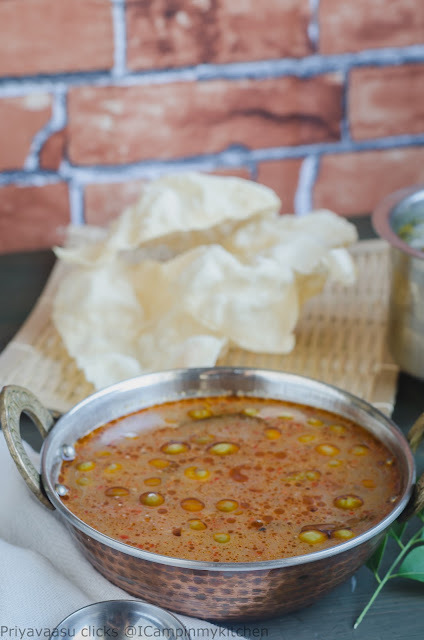 Take it off the stove and serve it with steaming hot rice and some appalam/pappad for a filling meal. 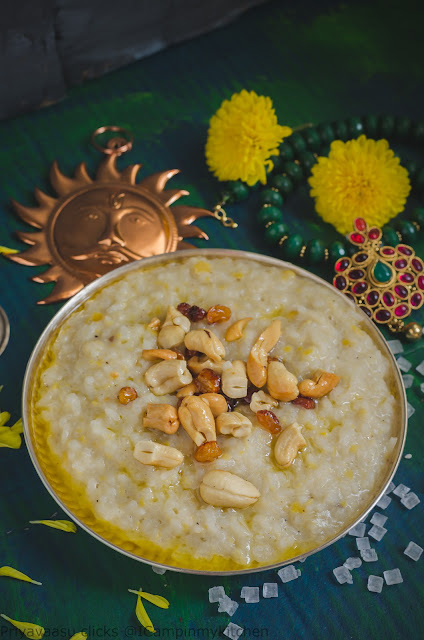 Festive dishes is the theme for this week, and i planned to do a Andhra Special dish for Makar Sankranthi. Original plan was to do Poornam Boorelu. But then i didn't have enough jaggery to proceed with that dish. 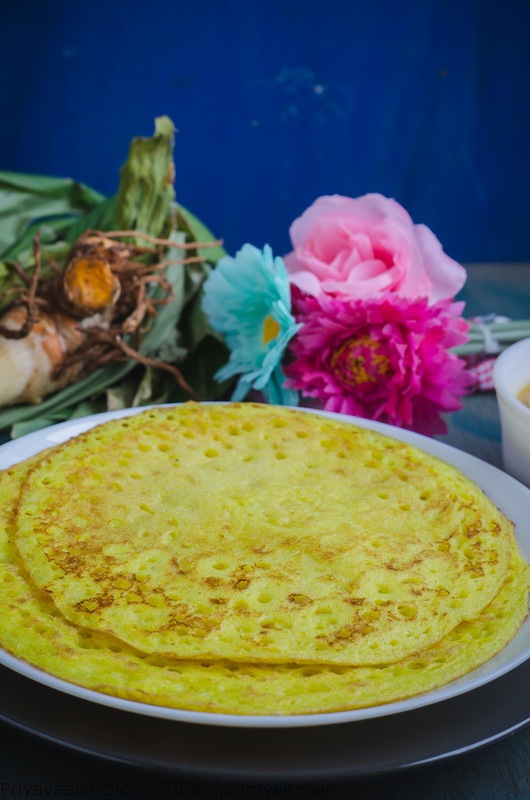 So, last minute plan change and i made this Pulihora. 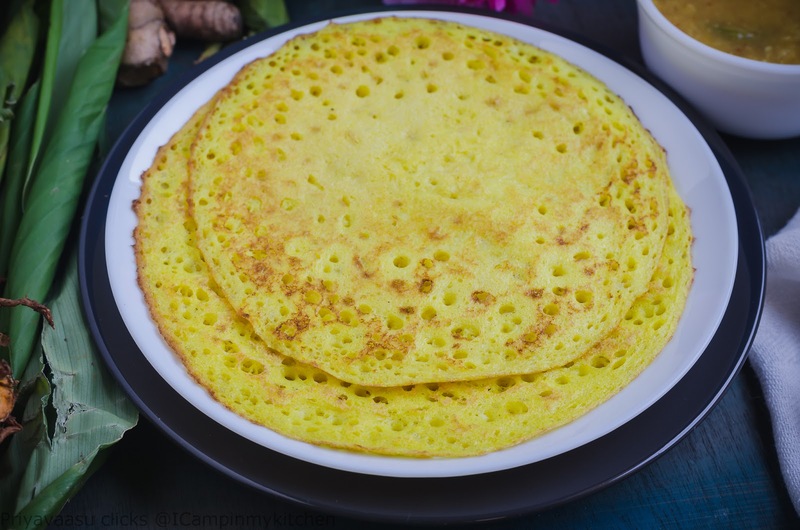 Aava Pettina Pulihora, Aavalu means mustard seeds in telegu,mustard seeds are roasted, pounded and added to the pulihora. It renders a unique flavor to the dish. 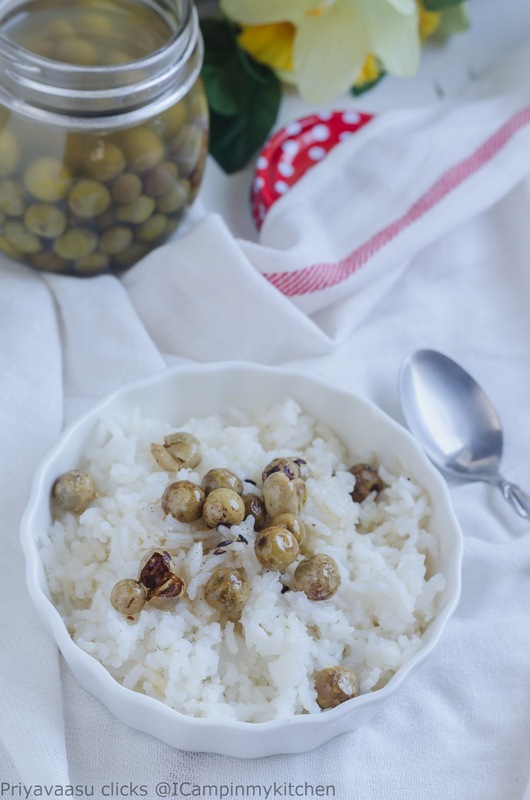 Some might not prefer the flavor of mustard in the rice, but it is highly recommended. 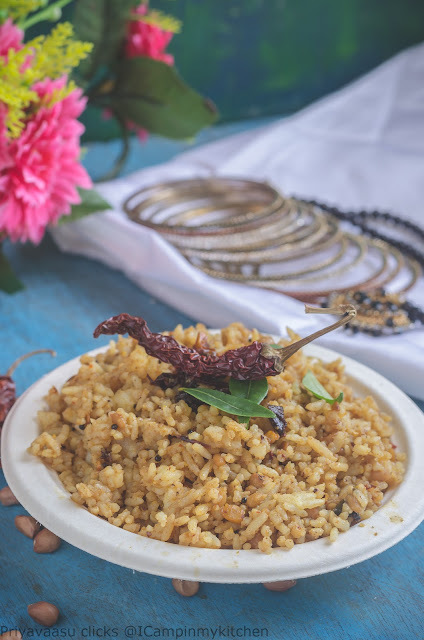 If you love aavakkai, then you will love this rice too!!! 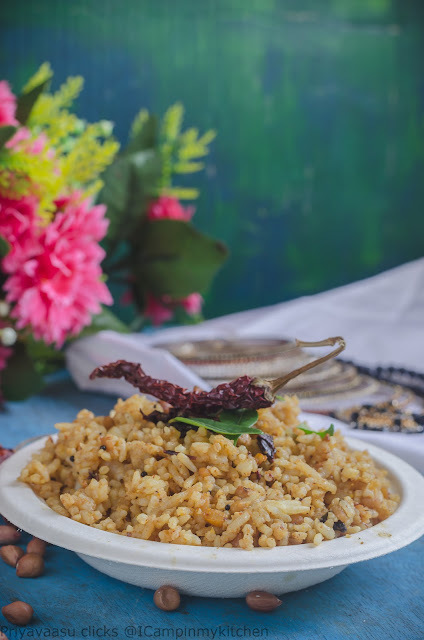 If you have cooked rice ready then, this recipe is just a breeze. 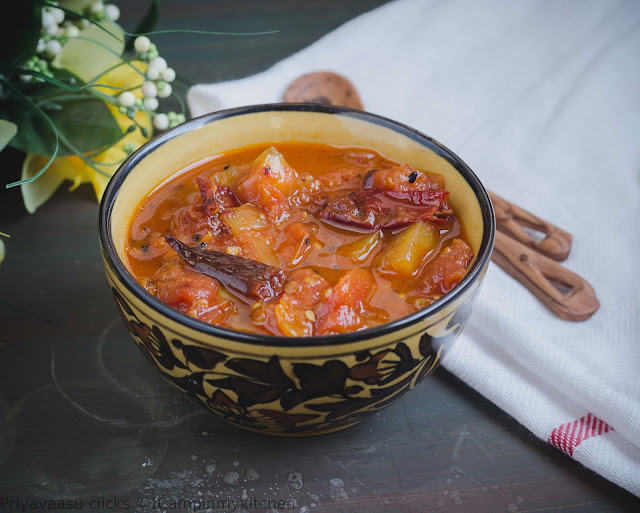 All you need is to cook the tamarind to a saucy consistency with some delicious tempering. The aroma of the tempering itself will make you hungry. I made this for my lunch today and kept a portion for my hubby and kid. Both loved it to the core. The flavors develop well, if you rest the rice for an hour or two. 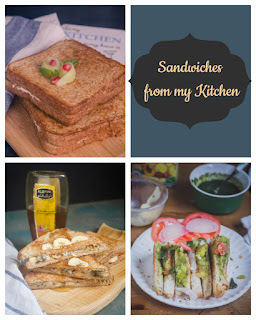 With that unique mustard flavor and yumm tempering, this is going to be repeated recipe at home now. In a pan, dry roast the mustard seeds given under "Ingredients", powder it in a mortar-pestle. keep it aside until use. Soak the tamarind in 1 cup of water and keep aside for 15 minutes. After the said time, extract juice from it and keep ready. In a pan, add oil, splutter mustard seeds, add hing, red chilies and green chilies, followed by chana dal and urad dal, peanuts. Let the dal turn golden. Pour the tamarind extract on the tempering and let it cook for 8-10 minutes. By the end of 10 minutes it should thicken and become saucy and oil should separate. Take it off the stove. 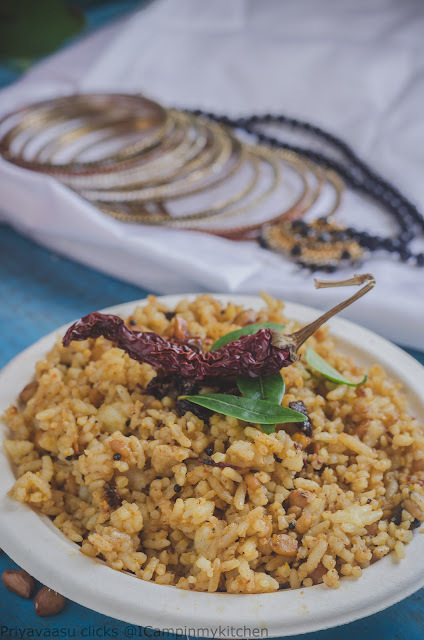 Spread the cooked rice on a wide plate, Add 4-5 tbsp of tamarind mix to the rice, along with powdered mustard and salt. Mix well. Check the taste and add more paste if needed. Any remaining paste can be refrigerated. I love my pulihora little more saucy, so added all the paste and enjoyed it with Bittergourd fry for my lunch. Festive specials, is the theme for this week. I have chosen Pongal/Makar Sankranti Specials from South-India. 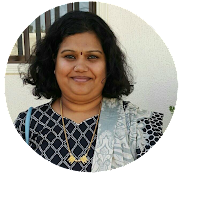 First in the list is Ellu Bella, from Karnataka. 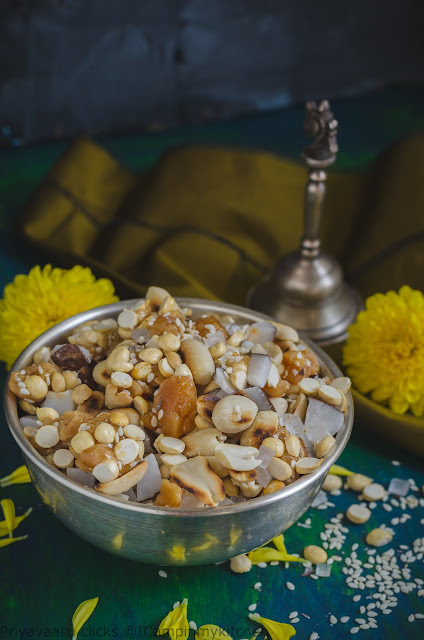 A simple mixture of peanuts, sesame and jaggery with copra. This mixture is distributed along with betelnuts,fruits and sugar moulds on the Sankranthi day. There is actually no recipe at all, you have to just roasts peanuts and sesame seeds and toss it with other ingredients, that's all, the recipe is ready. Dry roast the peanuts, take care not to burn. Remove it onto a kitchen cloth, close and rub vigorously to remove the skin. Transfer the skinned peanuts into a bowl. In the same pan, dry roast the sesame seeds, add it to the peanuts. To this bowl, add fried gram and sugar candy. Let this mixture cool well. 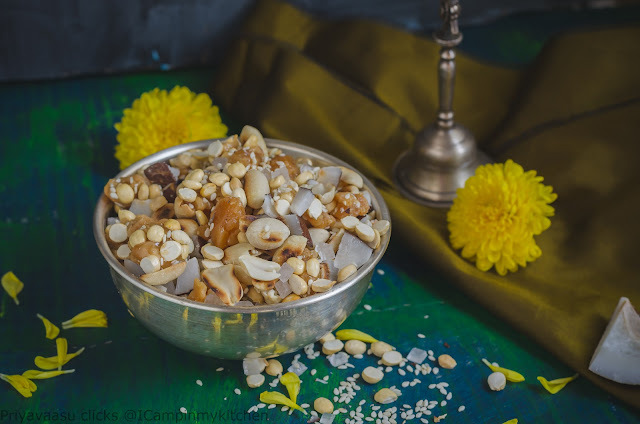 Chop the copra/dried coconut into small pieces and added it to the peanuts mix. Add the jaggery to this and mix well. 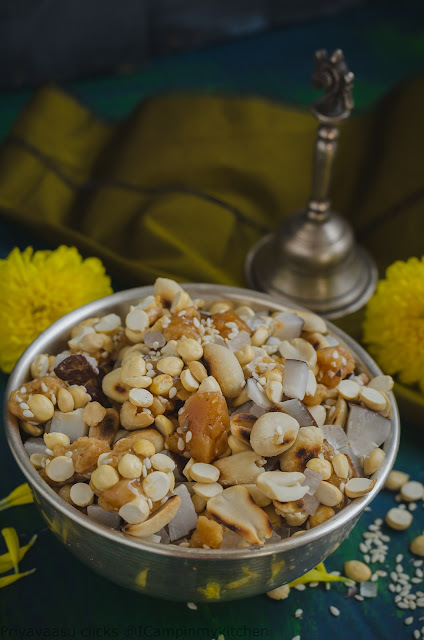 Do not add jaggery to the hot peanuts, it will melt and cling together. So, let it cool a bit, then add the jaggery. Mix the contents well. Store it in an air-tight container. 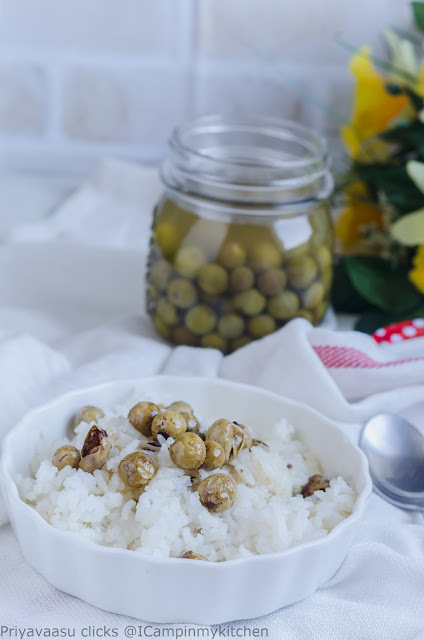 I m a big fan of Indian Gooseberries, humble amla. Last year, me and hubby used to eat an amla, everyday empty stomach, first thing in the morning. The effects were so visible in our blood report after 2-3 months. Not only that,it boosts our immunity so well, i didn't have even one episode of antibiotic last year. Somehow, the habit went off track after we came back from vacation and now this year, we have started again. While looking for some interesting spreads, i came across this amla jam at Nishamadhulika's space. I had all the ingredients at hand, so made immediately. Since it was festival for the past 2 days, i didn't get time to sit and post it on the same day. 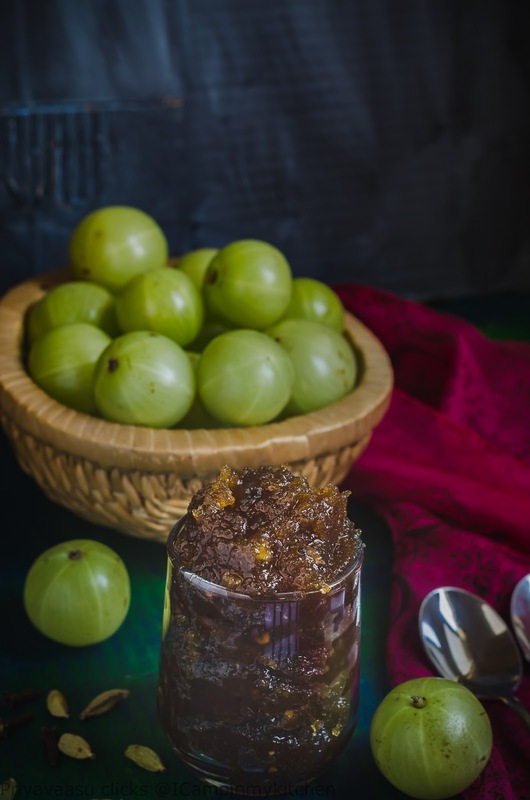 It is better to be late, than never, here is a simple jam/spread made using gooseberries and spices used in day-today cooking. I served this spread on butter toast for my elder one's evening snack today. He liked the taste. I m not sure whether my lil one will like it or not. 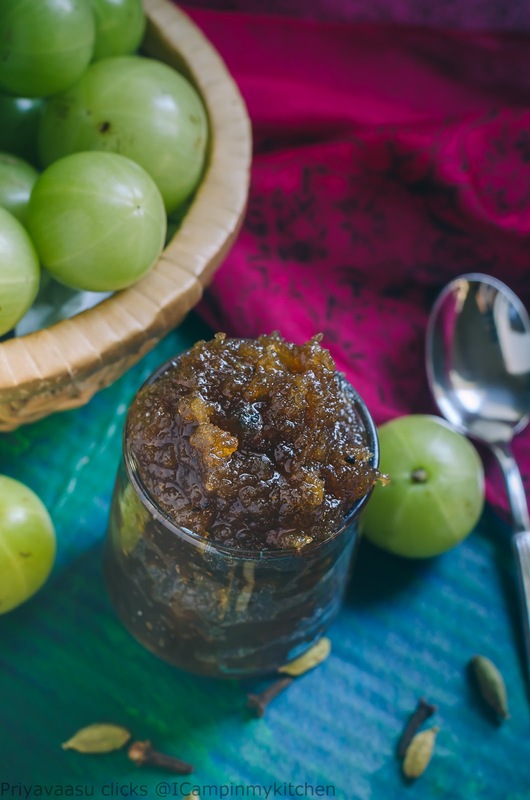 The amla, even when sauteed with jaggery, has its mild flavor in the jam, which we adults can understand and enjoy,but the same cannot be said with kids. Try it on toast first, if they like it, you can enjoy it on roti's, paratha's, etc. 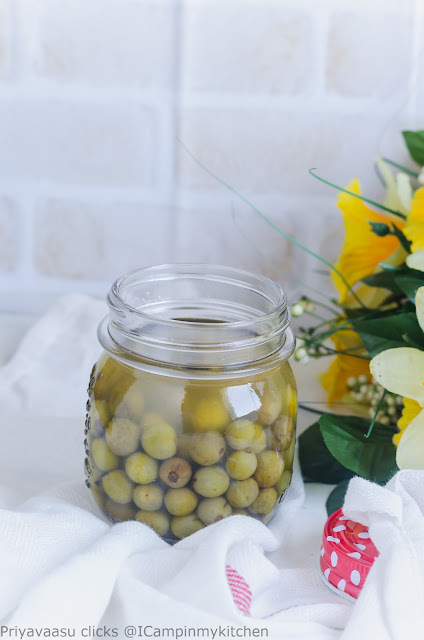 Wash the gooseberries with water. Take them in a saucepan, add enough water for them to immerse well. Cook them on stove-top until they are done. Cooked berries, crack on top. It will take hardly 15-20 minutes to cook. Let the berries cool well. Drain the water, remove the seed from the berries, Take them in a blender, along with cardamom, cloves and pepper and blend until smooth. You must not be needing any water, if needed add 2-4 tbsp of water to get a smooth mixture. 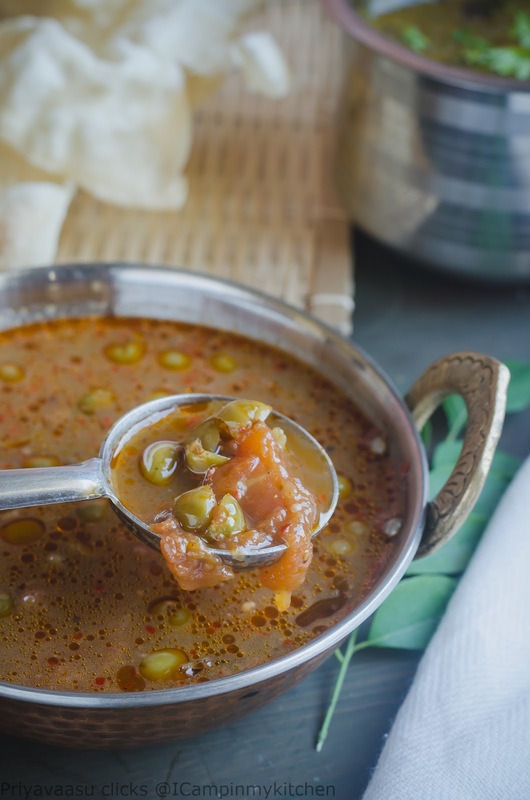 Heat a non-stick deep saucepan, add the ground gooseberry mixture and jaggery, let it cook until it comes together well. Keep the flame simmer, never make it high, or else the jam might burn at the bottom. Keep stirring often. The jam splatters as it cooks, so make sure to scrap the sides as you stir. 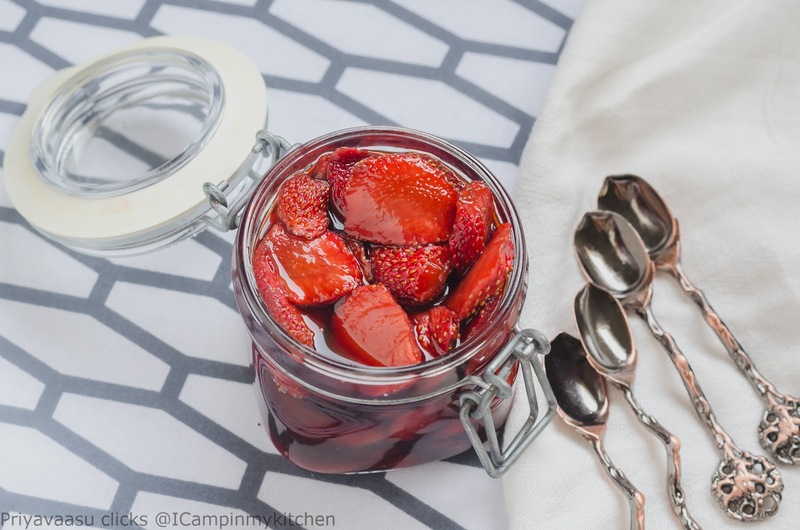 Keep the flame simmer and stir it often, the jam is done, when a spoon of it dropped on a plate, stays in one place and doesn't run. If it is runny, cook for another 2-3 minutes. Once done, let it cool completely in the pan. Transfer it to an air-tight container and refrigerate. 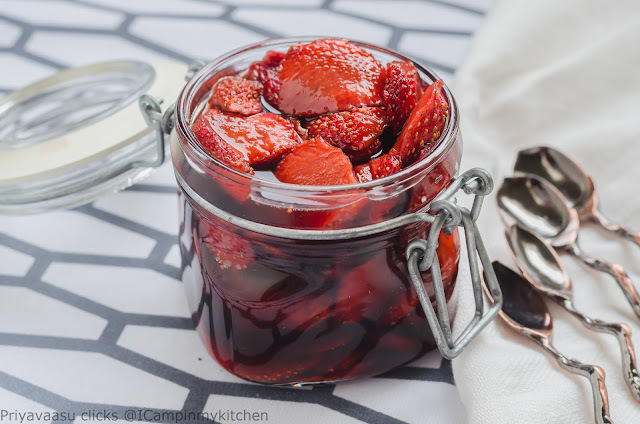 We tried it on a crisp toast and loved the taste of the jam. The jam itself tastes like Chywanprash and those who love the taste of it, will very well like this homemade healthy alternative to it. "Appa, you have to taste the chutney amma made today", that is how my elder opened the door for his father. He tasted the chutney for his dinner. This chutney is from +sangeeta khanna's Banaras ka Khana. 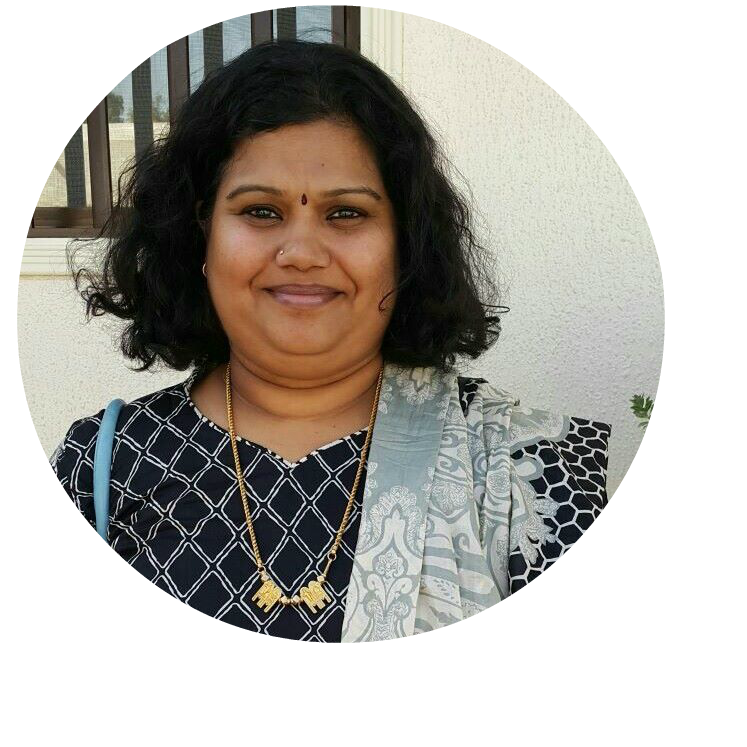 She has shared this chutney on her FB page, i made a small quantity today, to check my people liking. 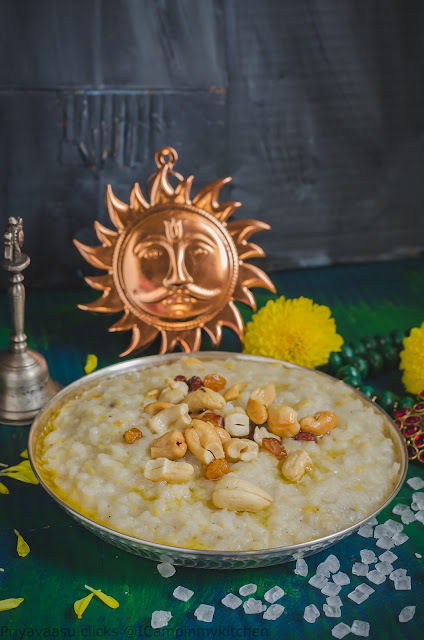 To my surprise my elder one loved it, i was a little skeptical about that sweet and hot taste of it, he paired it with curd rice and licked the plate clean. 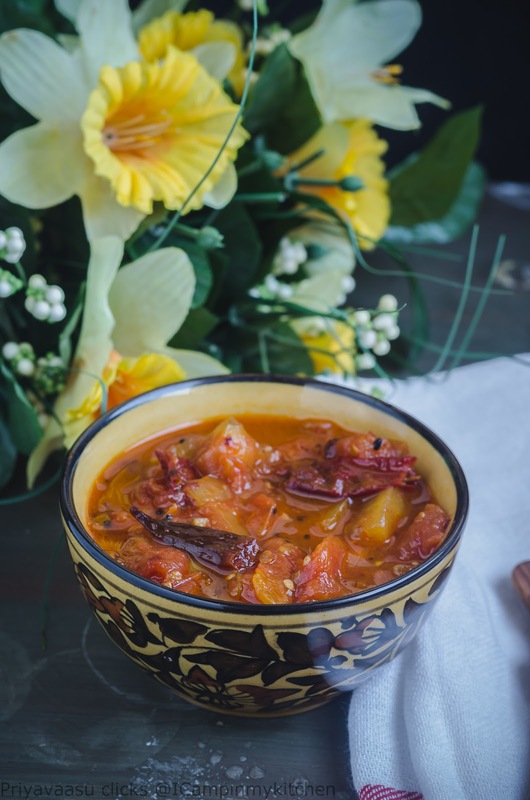 I served this along with Dosa for my hubby's dinner, he too liked it, and my small batch got over. This recipe is definitely a keeper. I m planning to make another batch during the weekend. 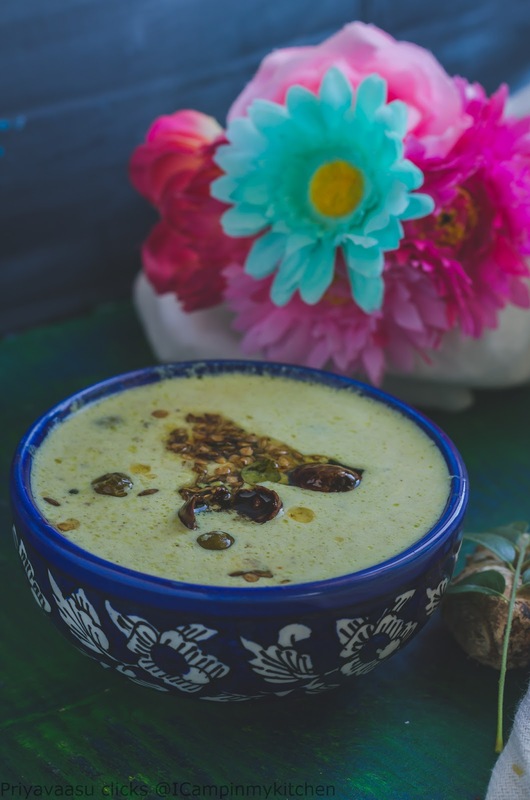 This chutney can be paired with bread, paratha and even dal-rice. 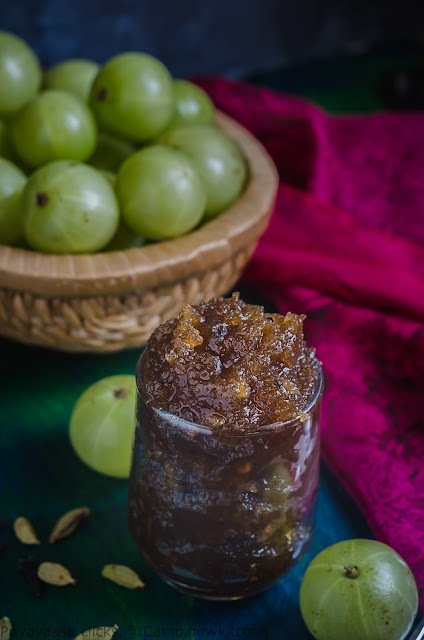 Make a batch and enjoy this hot and sweet chutney! Wash and chop the tomatoes roughly. Heat oil in a pan, splutter mustard seeds, next add nigella, fennel and fenugreek seeds. Saute them until nice aroma emanates, now add the broken red chilies and finely chopped ginger. Let it sizzle for a minute. Add the chopped tomatoes and 1/4 cup of water and salt. Let it cook covered for 10 minutes in a low flame, until the tomatoes get cooked and becomes mushy. Remove the cover, add the crushed jaggery and mix well. Let it sit for another minute, the chutney would be saucy and thick. Remove it from the stove. Let it cool completely. I was totally blank today, didn't know what smoothie to make. I had some apricots, kiwi's, banana's and strawberries in the fridge. Since it is a no banana smoothie, i was left with 3 fruits in hand. 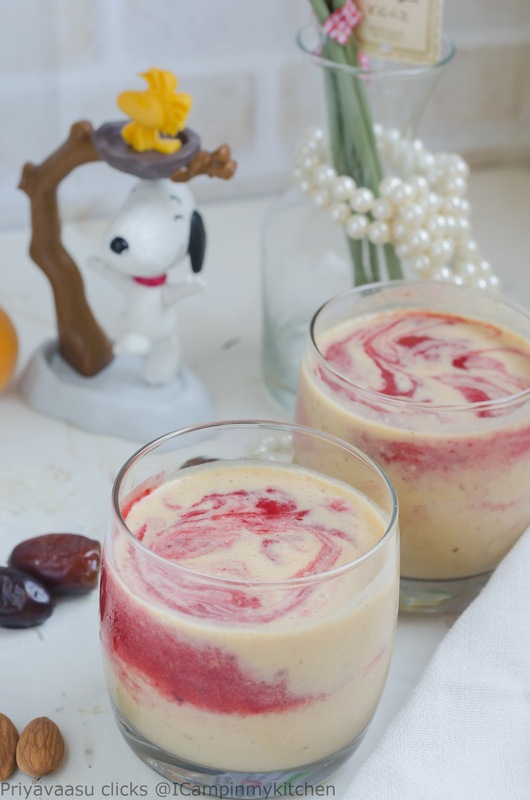 I remembered seeing a swirl smoothie while blog-hopping sometime ago. That is how i got the idea of today's smoothie. Thank god for my memory, the smoothie was out of the world, the flavors were so amazing. 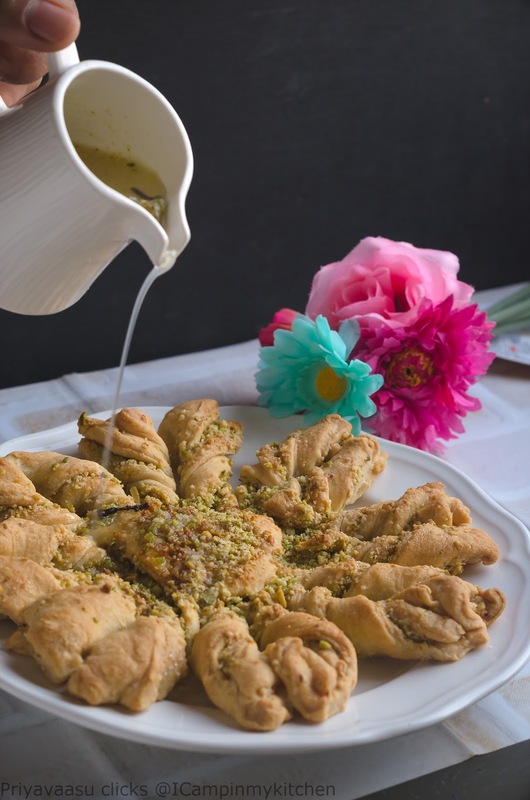 One of the best recipes to surprise your people at home with colors on the breakfast table. Try and let me know how you liked it. 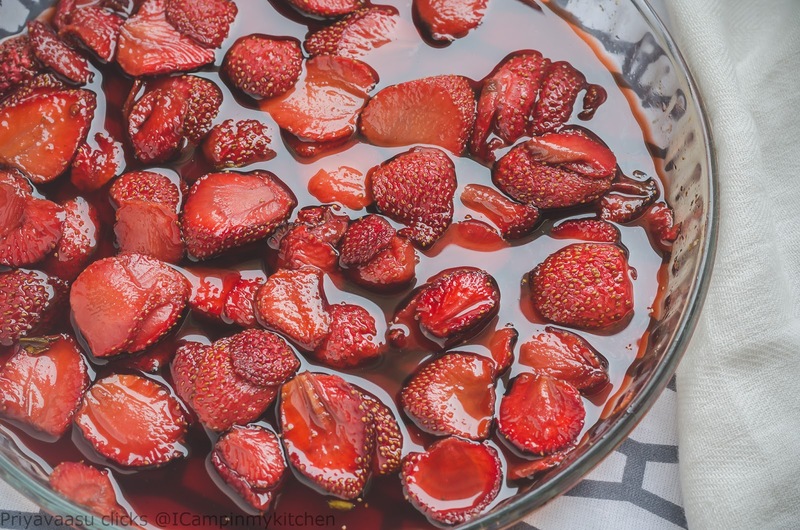 1 cup strawberries, i used frozen. If using frozen berries, leave it on the counter for 15 minutes, so it will be easy to blend them. If using fresh,you can blend them directly. Blend berries with or without sugar until smooth and keep aside. Wash the blender well. 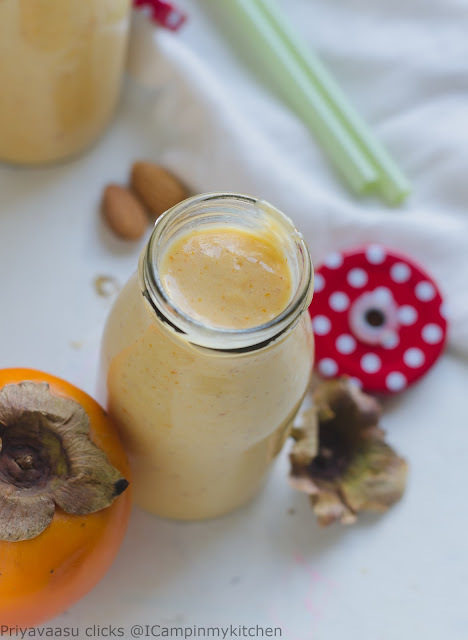 Take cut apricots, dates, almonds along with milk and blend smooth. 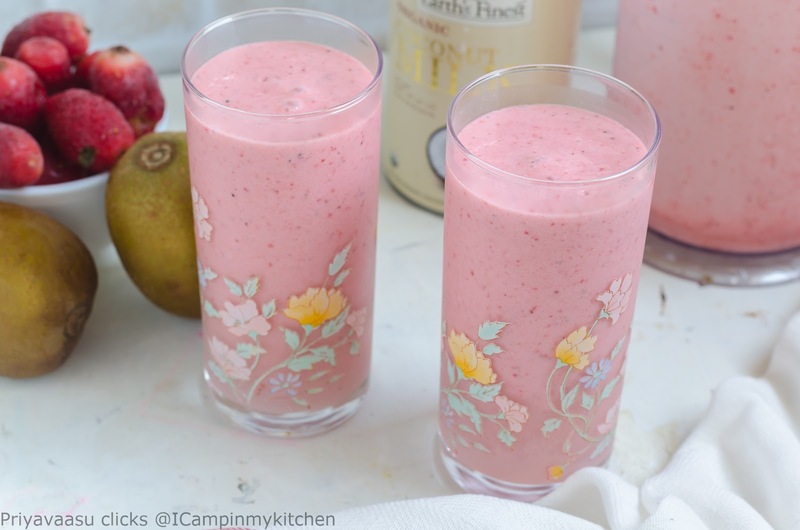 Now to serve, take two 300ml glasses, Pour apricot smoothie till 1/4th of the glass, top with 2-3 tbsp of strawberry smoothie on it, top it with another 1/4 cup of apricot smoothie, followed by 2 tbsp of strawberry smoothie. Do the same with the other glass. Take a long straw and swirl the smoothie. to get beautiful patterns on top, and serve. It tastes absolutely divine. I bought a pack of zespri kiwi's last week, i didn't notice what type of kiwi's they were, to be honest, i never knew other varieties existed!😃 when i cut it open today, they were amber in color, i immediately checked the cover to see whether i really bought kiwi or something else? There it was Sungold Kiwi!!!! Sungold Organic kiwi are another variety of kiwi that are amber in color. Love the taste of it and i m already getting lot of ideas to use them well. So, today i was in a mood to make Kiwi-strawberry smoothie without banana's, in-fact all the 3 smoothies, lined up for this week are without banana's. 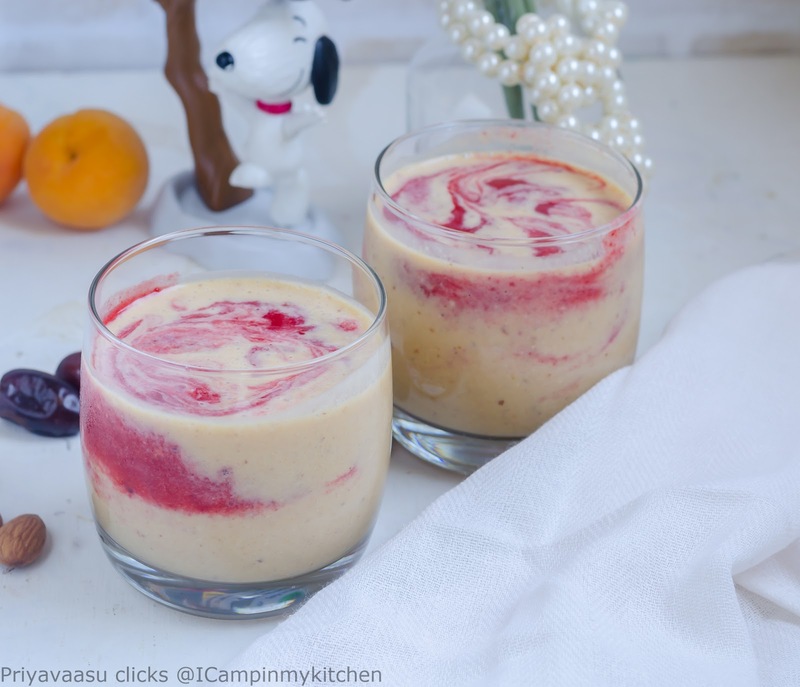 Banana's give volume to smoothies, they make it thick and creamy and also adds it natural sweetness! So why to omit that, you may ask? What if we don't have banana's? or avoiding banana's for some crazy diet? or simply cannot have a banana or don't like a banana? 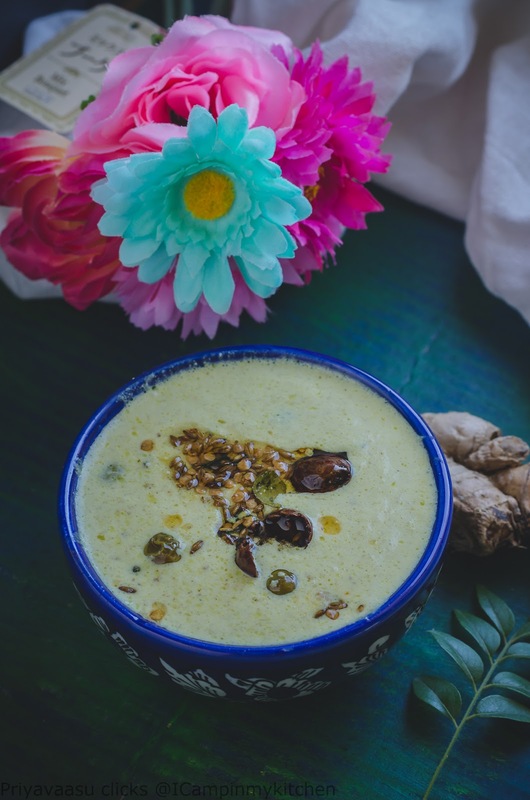 If for any other reason, you don't want to include a banana in your smoothie, you can always try adding almonds, oatmeal, chia-seeds, softened poha, to it. 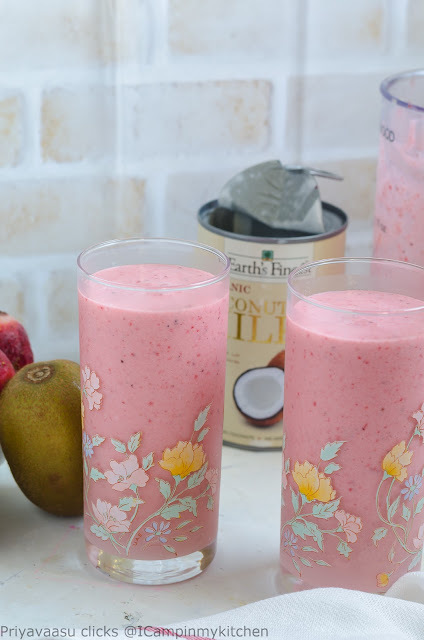 They will give the same amount of volume and creaminess to your smoothie, as a banana. If you still feel it will be runny, then try using yogurt or coconut milk for a rich and creamy drink. 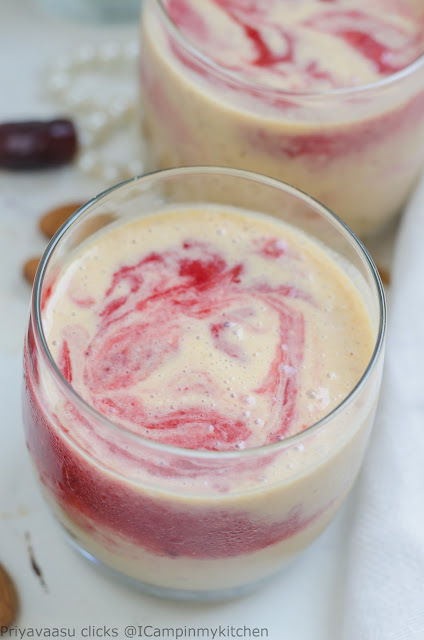 This smoothie was such a delight, with the creaminess of coconut milk and sweetness from kiwi and color from the berries. Try and let me know how you much you enjoyed it! Cut the kiwi fruit into two halves and scoop out the flesh using a spoon. 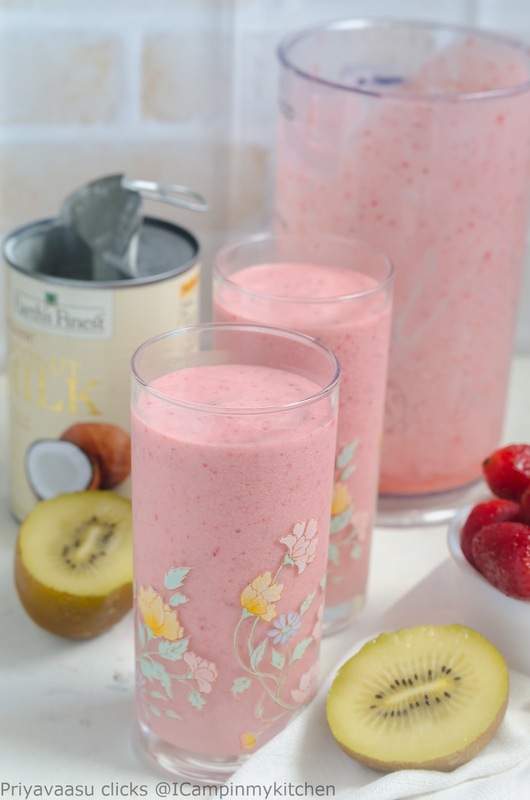 Take the kiwi flesh, along with strawberries in a blender. 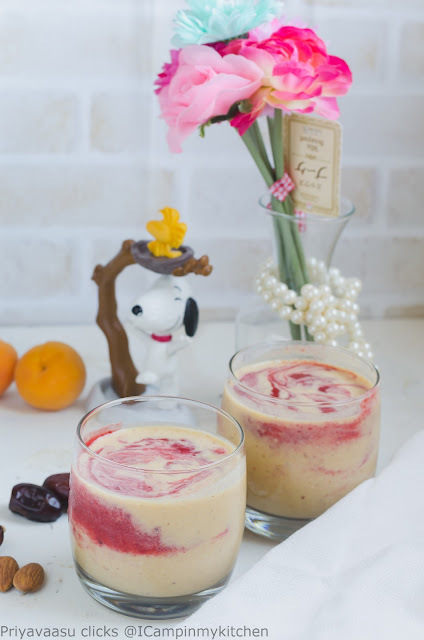 I used a hand blender, blend the fruits until smooth. Now add 1 cup of coconut milk to this and blend smooth. 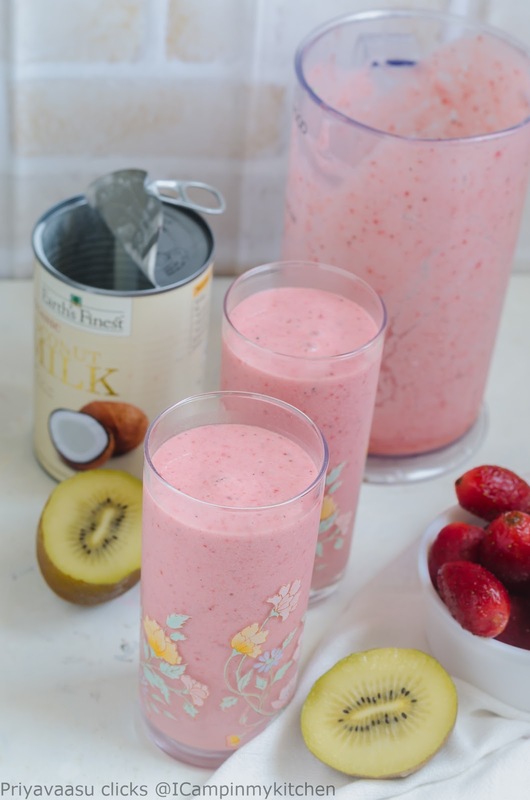 Take 1/4 cup of water in the same cup in which you measured the coconut milk, swish it and add it to the smoothie and blend until smooth. Pour it in tall glasses and serve immediately. I refrigerated the remaining smoothie, with a cling wrap over the jar. It stays good up to 4-5 hours. Persimmon, i had and still have difficulty in pronouncing this fruit name. For many days, i have called it permisson 😦. While reading about them, i came to know, there are lot of varieties of Persimmon and some are non-edible by humans😯. Among the edible varieties like hachiya, kaki, jiro they are also classified as Astringent and non-astringent. Astringent varieties, need to be fully ripened before eating them, or else it will give you a very bad after taste, you will hate that fruit. 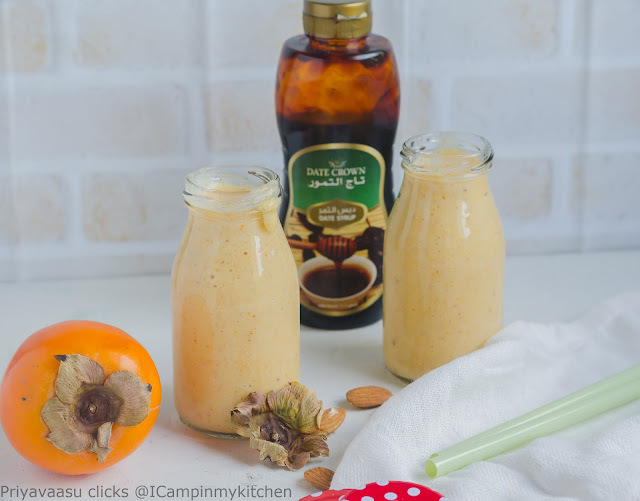 The variety i used for this smoothie, hachiya persimmon is astringent. I picked up well-ripened fruit, that was very soft and makes a mark when touched with finger. Another warning about the smoothie, this smoothie congeals/gels fast. So, serve it immediately, do not rest it for even 10 minutes. We don't mind a bit thicker pudding-like smoothies. If you are left with jelled smoothie, dont worry, make a smoothie bowl with it. I served this in a bowl to my hubby, garnished it with some cut persimmons and almond silvers. 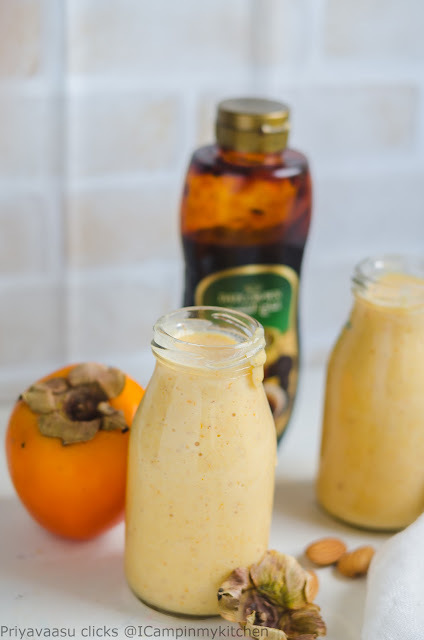 Wash and cut the persimmon into chunks, take the fruit chunks and almonds in a blender and blend smooth.Add milk and dates syrup to the fruit pulp and blend until smooth. Serve immediately. This smoothie congeals/jells pretty fast. If left for 10 minutes, it will turn like a pudding, so serve immediately. If you don't mind pudding like consistency, then serve it as a smoothie bowl, topped with some fresh cut fruits and nuts. Wishing you all a beautiful New Year. This is a delayed post, originally planned for last week of December. I was playing low, with a bad back, couldn't sit in the lappy for more time. And with 3 boys at home, i simply couldn't steal time for myself. 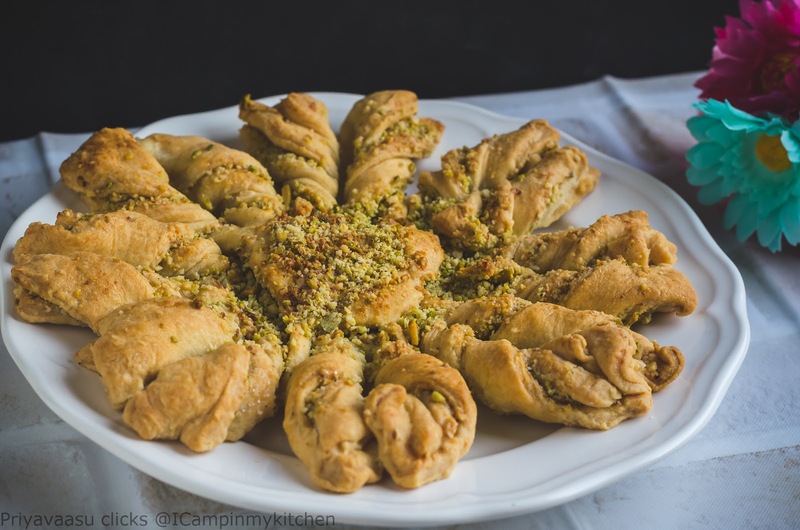 This is another simple bread, with puff pastry sheets. I saw a video on FB, i dont remember the page, it is of a brand, promoting their pastry sheets. Loved the simple idea, so i made it last week, for the hungry mouths at home. Thank god, i made 2 breads. One as a star and other a vaguely shaped like Fougasse. I served them the Fougasse, they licked the plate clean! 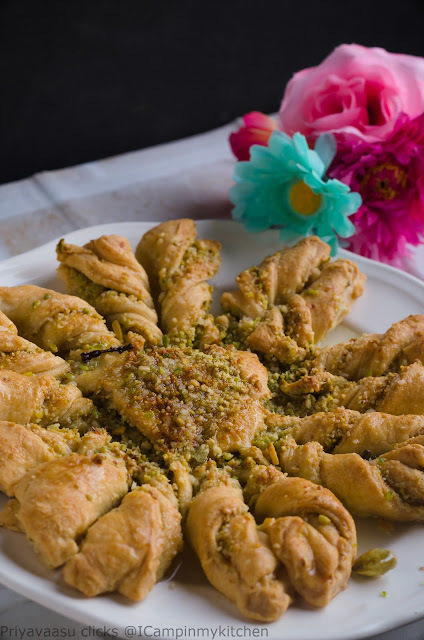 The pastry is sweetened with orange juice infused sugar syrup, which heigtens the taste even more. This can be baked a day or two ahead, and can be warmed before serving, add the sugar syrup just before serving. 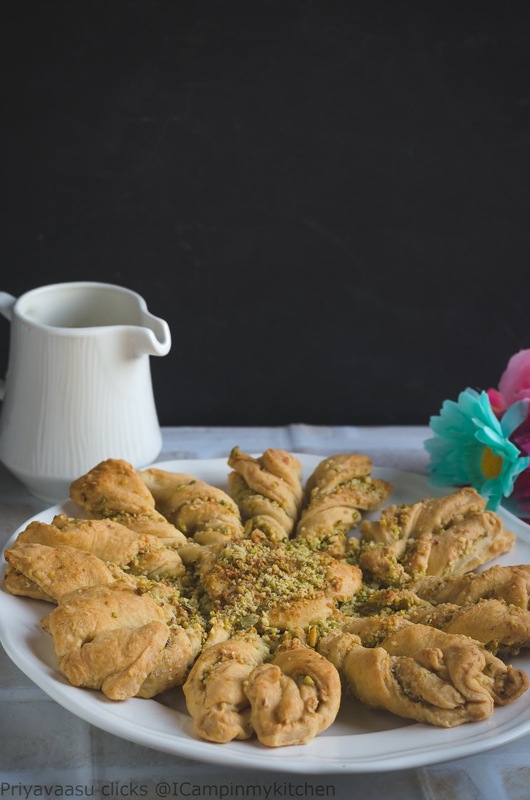 A simple and pretty bake for parties and get-togethers. Try and let me know how you liked it. 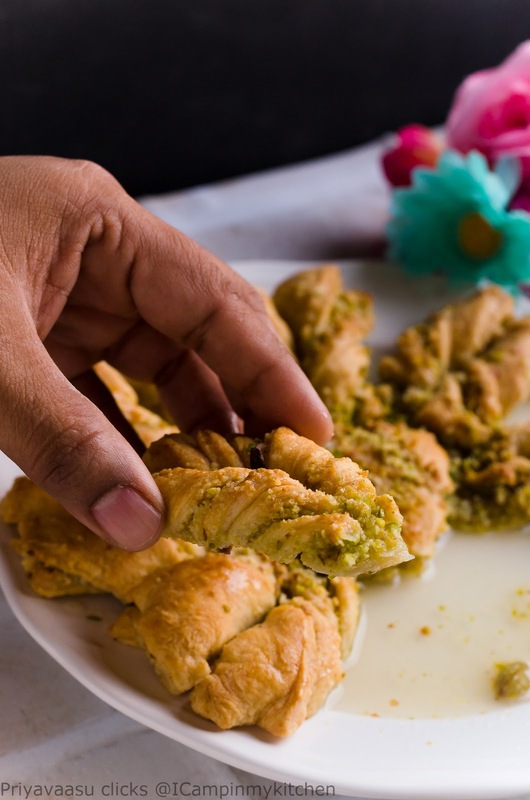 Take all the nuts, along with cardamom and cloves in a mixer and pulse it to get a coarse powder.Remove the puff pastry sheets, and let it thaw for 30 minutes on the kitchen counter. Place one round-cut pastry sheet on a well greased baking pan, brush the sheet with butter and spread nuts powder generously on it. Now place the other sheet on top of the nuts and close. Now comes the fun part of cut and braid. Place a small dessert bowl(roughly 1.5 inches in diameter), in the center and cut the sheet into quarters from the bowl. Now cut each quarter into 3 parts. Starting from any point, twist two strings in the opposite direction to form a ripple and press the edges together to seal like a petal. Preheat the oven to 220C. Brush the top of the bread with some milk and sprinkle some nuts powder on top. Bake it for about 20-22 minutes until the top turns golden brown. While the bread is baking , make the sugar syrup. Take everything, except orange juice, in a sauce pan, let it boil until sugar dissolves completely, Take it off the stove. Add orange juice and let it cool. Remove the star. Let it cool for 10-15 minutes. Pour the sugar syrup on top and serve it warm. Just see them dissappear, my people even drank the sugar syrup, like coffee!! !